Hunters of the American Revolution: They showed up with an intimate knowledge of our swamplands and backcountry, armed with Kentucky rifles and, against all odds, helped the Continental Army win a war. In a new book written by historian Philip Dray, “The Fair Chase: The Epic Story of Hunting in America,” readers are reminded of the critical contribution U.S. hunters of the American Revolution made to win the war. In an interview with Vox.com, Dray cites the Revolutionary War as a turning point for how hunters were perceived in U.S. culture. “In the 17th century in America, early 18th century, there was some concern about hunters because they tended to be people who lived apart from civilization. They lived in the woods, they showed up occasionally to sell pelts or meat or whatever. There was kind of a sense that they would maybe become obsolete or something as civilization moved ahead and so on. “That all changed during the Revolutionary War when suddenly the frontiersmen, the hunter, suddenly showed his value. Somebody like Daniel Boone was in a way like a founding father — a founding hunter, basically. He was a militia leader during the war, an immensely skilled hunter, and, of course, later a pathfinder into Kentucky. [There were also] people like Davy Crockett a few decades later. And, of course, you had Buffalo Bill Cody. On Quora.com, Robert Marshall, a U.S. history teacher and co-founder of ReadingThroughHistory.com, cites advantages Americans had over the Britain Army, namely fighting styles and marksmanship. Specifically, he recognizes the era's small-game hunters. This isn’t a direct reference to hunters or hunting, but you might wonder what advantage modern Americans would have over troops invading our borders today. As a vastly more urban and metropolitan society, Americans know the main highways and interstates well. But with fewer Americans tied to the land in any meaningful way, how many would know how to navigate the back country, swamplands or forests to their advantage in a war-torn country? And would today's home-field advantage rank as less or more of an advantage than it once was given the advent of Google Maps and the like? Thirdly, Marshall cites leadership styles, which ultimately allowed American forces to leverage hunters and their inherent skills most effectively. "In the British Army, where a man could buy a commission for himself (or) for his son, it was customary to appoint and promote officers based on family ties and titles of nobility, loyalty to the Crown, and political connections," Marshall said. "In contrast, the Continental Congress and George Washington promoted officers based on individual merit and performance on the battlefield." So maybe there was a young man similar in skills and education to Daniel Boone. Say he's from the rough and unsettled Kentucky landscape. Perhaps he was a rube, but he knew rifles, was an excellent marksman and could traverse wild terrain with ease. That guy would rise in rank in the Continental Army. Meanwhile a British guy with a similar profile, stood a slim chance of making anywhere near the Redcoats. Marshall's website, ReadingThroughHistory.com, is dedicated to keeping history relevant in an education landscape that is increasingly focused on math and science. For those looking for a quick summary of the American Revolution, you can read Marshall’s history brief on the war for free on Kindle. In the summer of 1775, riflemen from Pennsylvania, Maryland and Virginia joined New England troops already gathered in Boston to form a Continental Army. These guys rolled in wearing unusual, fringed shirts known as hunting shirts. At first, the shirt became synonymous with this group of mid-Atlantic riflemen, but the shirts were soon adopted by colonial fighters on a much larger scale. Information on the hunting shirts of the period, including the excerpt below, can be found on the Museum of American Revolution website. A hunting shirt from the era is on view at the museum’s “Join or Die” Gallery in Philadelphia. “A uniquely American garment that originated in the Virginia backcountry, (the hunting shirt) was thought to evoke the dress of Native Americans. "As stories of the riflemen’s marksmanship spread, General Washington saw a psychological advantage in outfitting thousands more of the American soldiers in these distinctive shirts. In his headquarters orders for July 24th 1776, Washington wrote that he 'earnestly encourages the use of hunting shirts,' in part because they were 'justly supposed to carry no small terror to the enemy, who think every such person a complete marksman.'" To learn more about hunting culture throughout America's history, check out "The Fair Chase," here. Featured image: In Battle of Guilford Court House, you can see the mix of soldiers wearing hunting clothing and others wearing uniforms of the regular militia. Courtesy of Soldiers of the American Revolution by H. Charles McBarron. 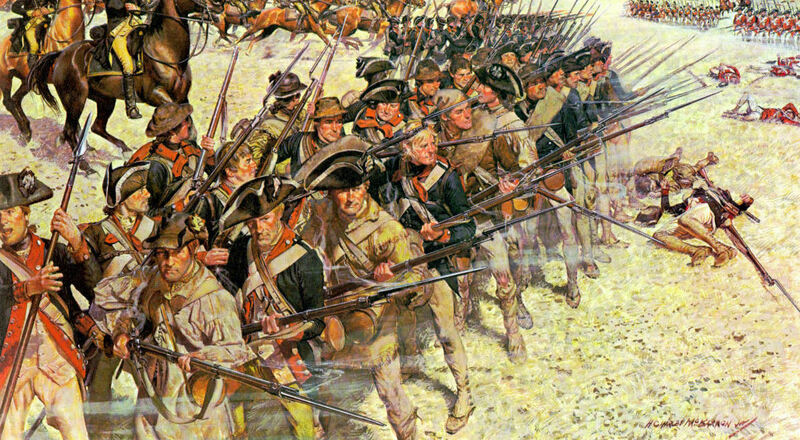 Downloaded from Prints and Posters: Soldiers of the American Revolution, Center of Military History. Access date: June 1 2006.